Performance ads help lift Q418 revenues despite stalling user growth. Snap’s new chief business officer, Jeremi Gorman, is leading a reorganisation of Snapchat’s sales team to improve understanding of its advertiser customers and to better serve emerging brands with response-led products. Gorman, who was Amazon’s global head of ad sales before joining the social network's parent company three months ago, told a conference call with analysts that the changes started last week and would take six months to roll out. The call accompanied Snap’s financial results for the fourth quarter of 2018, in which it reported a slight decrease in daily active users – something it had warned of previously – of 0.3% to 186 million during the three months. Quarterly revenues climbed 36% year on year to hit their highest yet, at $390m (£301m), taking full-year revenues up 43% on 2017 to $1.2bn (£926m). Gorman said that she wanted to evolve the ad sales structure from a "free for all" model that tends to suit rapidly growing businesses to one organised along client verticals. "When I came in, I noticed the sales team was set up to get as big as possible as quickly as possible, which oftentimes means that everybody can go after every account," she said. "[But] a vertical model really allows us to understand our customers and the industries in which they operate, so that we can be consultative sellers and go deep with those particular brands." Snap is hoping to deliver what big brands want by growing its nascent Commercials product, which is an unskippable six-second video ad placed within premium entertainment content supplied by its production partners. The company did not break out the revenue performance of Commercials, which first appeared on the platform in May 2018, but said the product helped to double the revenue it made from premium content between the fourth quarter of 2017 and the fourth quarter of 2018. Snap also claimed that it can now reach 70% of the 13- to 34-year-old US population with premium mobile video ads on a monthly basis. 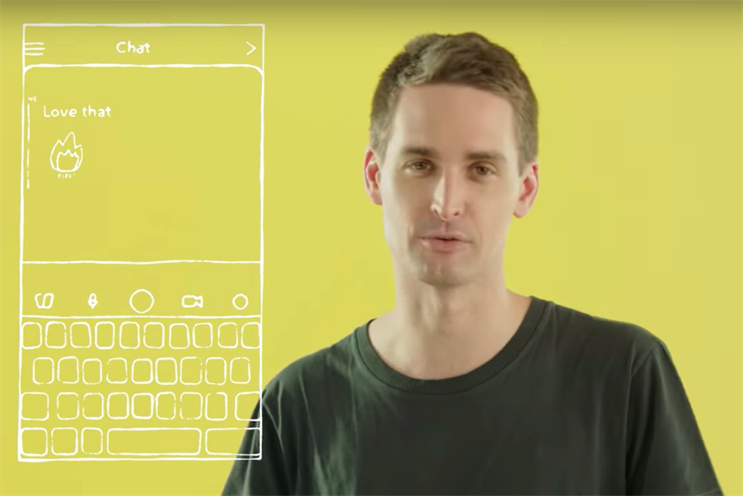 However, reading between the lines of executives’ comments on the call, Snap’s revenue growth has been driven more by direct response-flavoured ads than by pure brand advertisers. Interim chief financial officer Lara Sweet said: "We made a deliberate pivot last year to work with direct response advertisers as we shifted to self-service [ad sales]. Advertisers are allowed to bid against their KPIs such as app downloads or installs or sales. We’re seeing a lot of success in that direct reponse business." Gorman, who revealed that big-spending direct reponse clients included gaming apps and direct-to-consumer ecommerce brands, is forming a specialist direct reponse team that will cater to emerging advertisers as part of her sales reorganisation. "We know there are a lot of challenger brands out there and we can help them reach their audiences, particularly when they can build on a KPI that is relevant to them," she said. Snap chief executive Evan Spiegel commented that Gorman’s arrival would allow him to focus on product development, which is a priority in terms of returning the platform to daily active user growth. Spiegel is pursuing a redesign of the Snapchat Android app to make it work faster and use less bandwidth – something that he believes will help the company reach the two billion global Android users he claimed do not currently have the app. However, he was evasive about the timescale for the Android roll-out. Daily active user numbers may be flat again in the first quarter of this year, Snap indicated, saying that it was "cautiously optimistic" and did not foresee a decline from the fianl quarter of 2018. However, it predicted continuing revenue growth for the quarter of 24-34% year on year. No target was disclosed for when Snap will become profitable, but the latest quarter again saw adjusted earnings before interest, tax, depreciation and amortisation improve and operating losses narrow (from $361m in the fourth quarter of 2017 to $166m in the final quarter of 2018). In addition, revenue growth is outpacing costs.